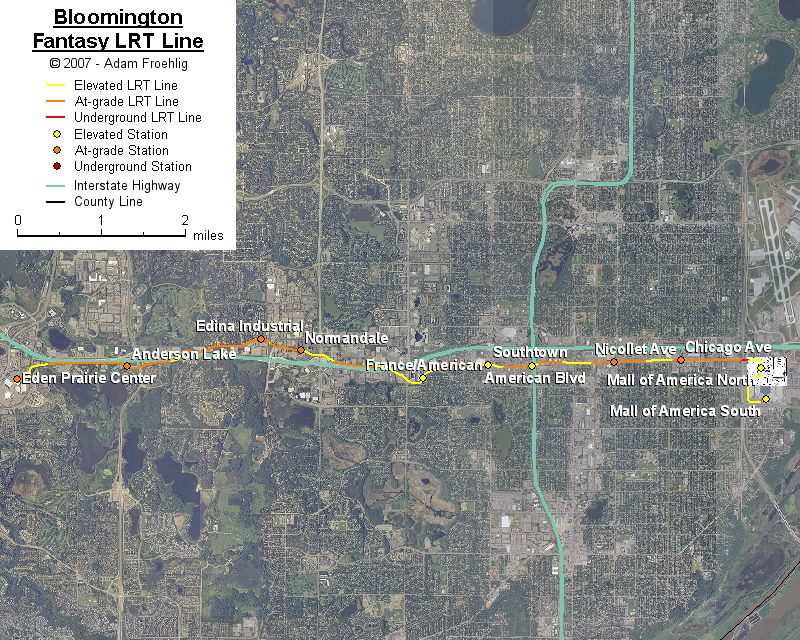 This line is a connector line envisioned along the busy and office-heavy I-494 corridor through Bloomington and part of Eden Prairie, connecting Eden Prairie Center with the Mall of America. 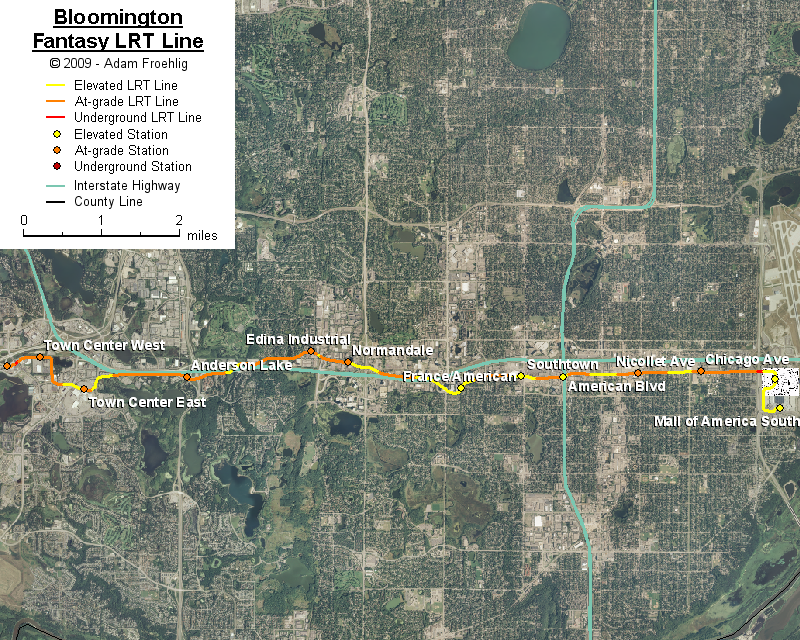 I initially came up with the idea for the line as a way to distribute passengers from my old I-35W line idea (now the Lakeville line idea) to the various office parks along I-494, and the idea grew from there to include connections to the Southwest line in Eden Prairie and the Hiawatha, Cedar, and Riverview lines at the Mall of America. Beginning at the Southwest Transit Station, the line begins following the Southwest line, along the south side of Technology Dr to the Town Center West station. Just east of Town Center West, the line breaks from the Southwest line and turns south along the west side of Lake Idlewind and through a couple large parking lots, turning east again along the north side of Singletree Ln. The line bridges over Flying Cloud Dr before passing through the Eden Prairie Center area. East of Eden Prairie Center, the line bridges over the Prairie Center Dr/W 78th St intersection, then follows W 78th St east, passing under US 169 (assumes the full-rebuild I-494/US 169 interchange is in place). Near W Bush Lake Rd, the line crosses over I-494 and follows the median of W 78th St on the north side of I-494, bridging over the UP RR near E Bush Lake Rd and MN 100 just north of I-494 (assumes full-rebuild I-494/MN 100 interchange in place). East of MN 100, the line follows the north frontage road before crossing again over I-494 west of France Ave. From here, the line follows American Blvd, bridging over France Ave, Penn Ave, Lyndale Ave, and Portland Ave in the process. East of MN 77, the line goes elevated, then turns south along the west edge of the future phase 2 of the Mall of America, passing between the future phase and Ikea. It then crosses over Lindau Ln before continuing along the west side of the west parking lot. The line finally turns east and follows the north side of Killebrew Dr before ending at the Mall of America station. An earlier version of this map, with my original western terminus at Eden Prairie Center (renamed Town Center East above), is here. Go to my suggested freeway/expressway changes. Go to my ideas for improving/upgrading Twin Cities area interchanges.